There’s an interesting thing that happens in the course of a restoration. Today it happened subtly, but in a moment. 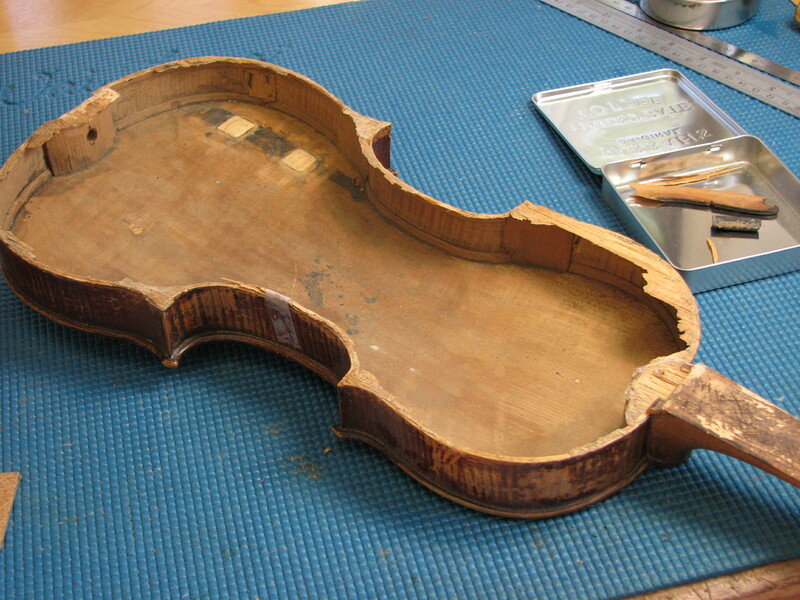 I recognized it as I shifted my tool and repositioned the violin top that I was working on. zzzzzzt! There it was, a sign of life. 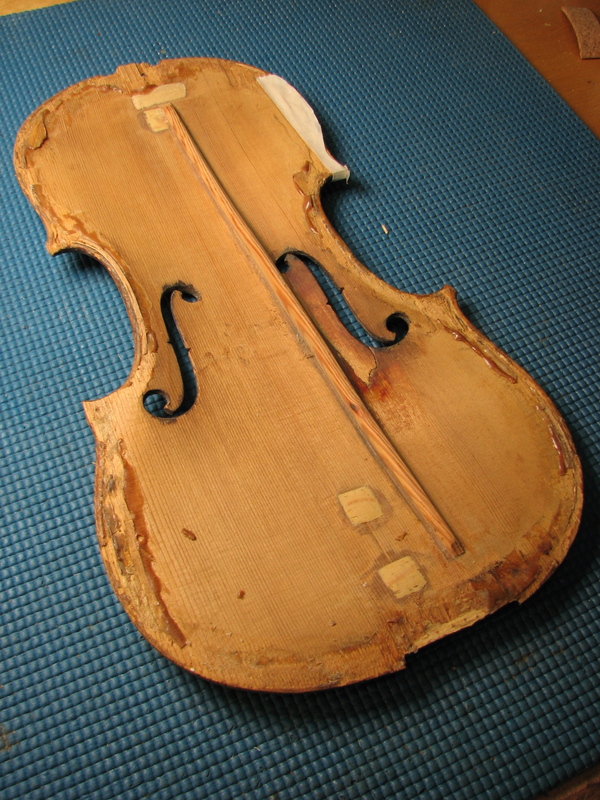 I’ve been working on a lovely old violin that has suffered not only the effects of a couple hundred years, but also some serious misfortune at the hands of unskilled violin “repair” hacks. It was a sickening mess or a titillating challenge, you pick. An instrument with multiple cracks, broken and deteriorated edges, loose bits of wood and a bad history with a glue pot, doesn’t vibrate. It buzzes, rattles, clacks and gasps or simply lies dead on the workbench. With a change of fortune it could become, yet again, a beautiful, healthy, vibrant and participating member of the performing arts scene. That’s my job. zzzzzt! It’s not a sound, it’s a feel. Gradually, as the cracks are glued properly, and the loose bits are reinforced or replaced, my patient remembers that it was MADE to vibrate. In my hands, it feels like a nicely tightened drum head. Ready. Excitable. Alive. 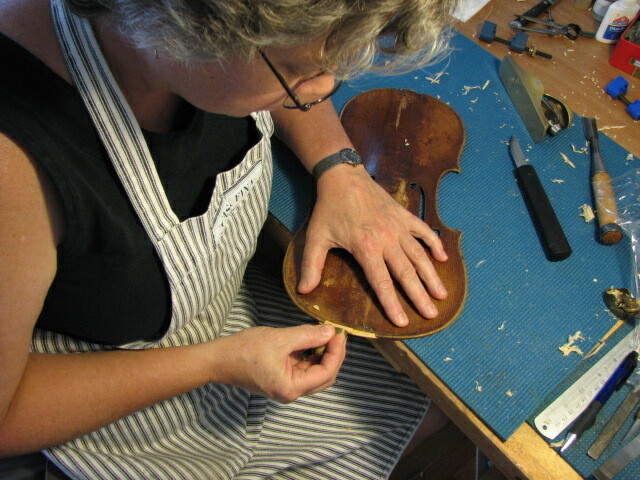 More on this fiddle another time – stay tuned! This is fascinating. You are crafting new music. Thanks! I like to think I’m doing my part!